I am failing miserably on the Wowza Wednesday posts. I seem to have Wednesdays that fly by. So here I am doing it on Thursday again! Better late then never. 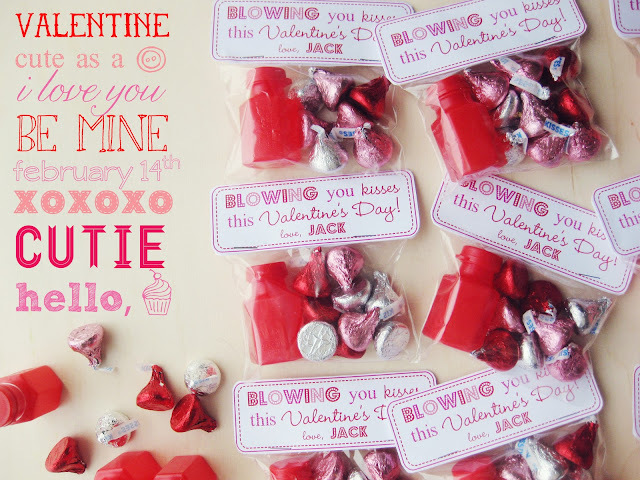 My Wowza this week so far would have to be creating my son’s Valentine’s for his class today. He was so excited for it, as was I. I found a really cute idea on Pinterest (obviously) and recreated it. Thank you to Polkadots and Puppies for making my life so easy! 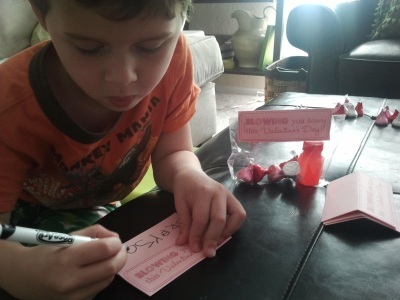 My son and I found the small bubbles in a pack of 24 at Target for $4…score! 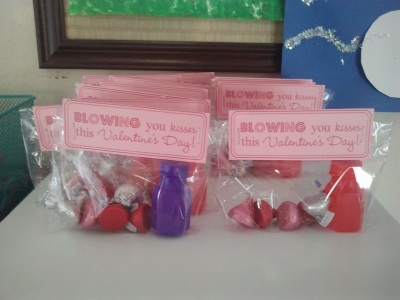 And then grabbed one bag of Kisses, which gave each student 5 pieces (plenty by mom standards.) I printed out the FREE printable to top off the bags and voila. Thank you Polkadots and Puppies! So easy, so cute…love! The best part hands down was having this little guy next to me…so excited, enthusiastic and rocking the crazy mismatched PJ’s! ﻿And I apologize for the horrible cell phone photos. My good camera wasn’t charged. The little treat bags are darling! No biggie about the Wowza. I'll be looking forward to next week's! Awww, JUST now discovered this shout out. Thanks!